With that in mind, we are proud to present the first of four bracket challenges to close out the year. 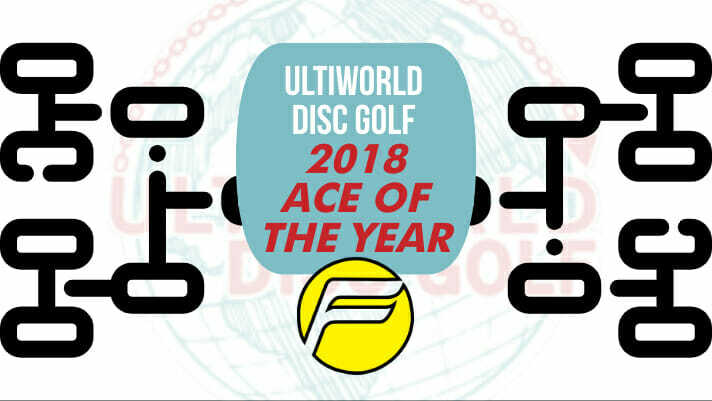 We’ve culled highlights from the sport’s best media providers and broken them down into four categories: Roller of the Year, Air Shot of the Year, Putt of the Year, and Ace of the Year. After each bracket is decided, the winners will battle in a four-way, College Football Playoff-style bracket that will determine the 2018 Shot of the Year. Pick your favorite entry for Ace of the Year from each matchup below, then come back next week for the next round. And if you’re having fun with this, feel free to share the love on social media. A special thanks to Jomez Productions, Central Coast Disc Golf, GK Productions, Gatekeeper Media, the Disc Golf Pro Tour, and others for capturing these clips. And we’re off! You expect a thumber to sit down where you want it to, but never do you think you’ll get the ground reaction Sias Elmore does at the Utah Open. This deservedly made it onto SportsCenter. Not to be outdone by a Champs vs. Chumps ace on the same hole, Chandler Fry outdid Simon Lizotte by hitting this straight woods shot during the final round of the Candian Championship. Same hole, same round. Both Ricky Wysocki and Trevor Harbolt rang up hole 8 at the MVP Open during the second round; Ricky with the forehand, and Trevor with a backhand. Whose was better? Gregg Barsby’s 2018 season really rounded into form while he was in Europe, so we had to include the downhill shot at Tyyni. Texas State gave us a couple highlights on this list, and Bradley Williams has the first. One of the smoothest throwers on tour pures this line. Eagle McMahon needed to get around a couple guardian trees at the Oklahoma Open and opted for the big sidearm hyzer. He had it dialed in. He didn’t have as far to go as Eagle, but Paul Ulibarri also expertly hit this forehand. Jomez getting the double aces in their home state. Slick. Can’t get enough Uli. He’s immediately back with the no. 2 seed for his ace on the island hole 17 at USDGC. Any ace is special when it happens at Winthrop, so A.J. Carey on his first throw of the USDGC has to make the list as well. Especially seeing as how Ken Climo was probably still hovering nearby. We’re still in awe that this skip ace from Emerson Keith was able to stick in the chains on a windy day at the Veterans Park Open. Over at the Georgia Flying Disc Festival, Matt Versola had a great story to go along with this bomb of an ace. Playing like a man possessed, Linus Carlsson was stacking aces at The Open. We’re going with his ace on hole 10 because the footage is better, but his hole 18 ace may have been more impressive. Staying in Europe, how about this uphill skip ace from Sindre Roar Fosse at the Norwegian Championship? Hole 3 at the San Francisco Open was made for a Sarah Hokom forehand. She made good work of it and made it on SportsCenter. What better way to celebrate the Women’s Global Event than with an ace like Margaret Sassaman? What a line. Comments on "2018 Ace Of The Year Bracket"